Beth Quinn Designs is a great place to get all your jewelery one of a kind pieces. They carry necklaces, bracelets, earrings, and more! I love the mommy necklace I received which has my own saying of "Center of Mommy's Heart" with the 5 jewels (in my kids birthstones) around the circle. The chain is really nice you can choose the antique silver or gunmetal-which is what I went with. I love the necklace it has a very study chain that my kids have more then tested and it has stayed in place. Have a wedding coming up? Beth Quinn Designs carries cute sayings for the bridesmaids to make that cute one of a kind gift, there is even something for the flower girl. Christmas is around the corner so why not get a nice piece for your mom, sister, aunt or anyone else that would love a personal one of a kind piece. 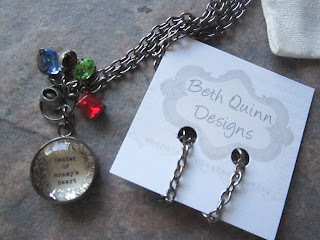 Beth Quinn Designs also has little girl necklaces, which are so cool because they can match mommy. She also offers Christmas ornaments, which have their own sayings, or you can personalize. One of the readers of 7 Kids and Us will win their very own necklace that says "Peace Love Joy" on a gunmetal chain. Giveaway is open to US residents only! Contest ends Jan 7th 2013. This is the necklace that the winner will receive! Disclosure: I was given the mommy necklace to help with my review. All opinions are 100% mine. I love it! Her designs are awesome! Sooo cute! Love them all! My girls and I would love this.